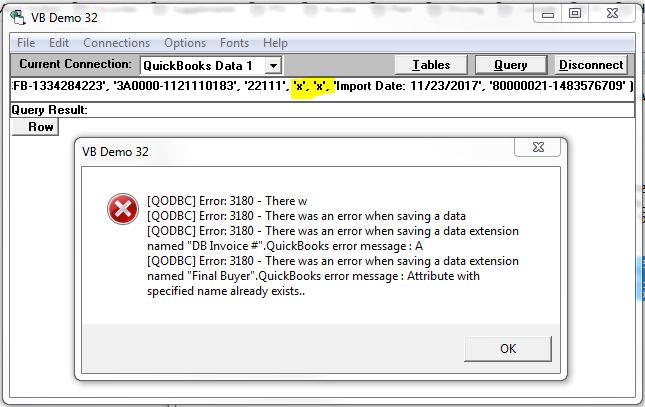 [QODBC-Desktop] Troubleshooting - Error 3180 - There was an error when saving a data extension named "".QuickBooks error message : Attribute with specified name already exists. Troubleshooting - Error 3180 - There was an error when saving a data extension named "".QuickBooks error message : Attribute with specified name already exists. I am using QODBC for creating Invoice in QuickBooks. I am using CustomField in QuickBooks. If I insert null strings into the two custom fields, like this, it works fine. But if I include any characters in the text string for either custom field, like this, I get the attached error. Below is the error in the QODBC & QuickBooks SDK logs. Error: 3180 - There was an error when saving a data extension named "Final Buyer".QuickBooks error message : Attribute with specified name already exists..
20171123.123634 E 11176 DataExtStorage::DoAdd Error saving: data extension named "Final Buyer".QuickBooks error message : Attribute with specified name already exists. You will face this type of issue when you have set the default value in the Custom Fields. The default strings take precedence over the new values set in the insert statement & issue happen. 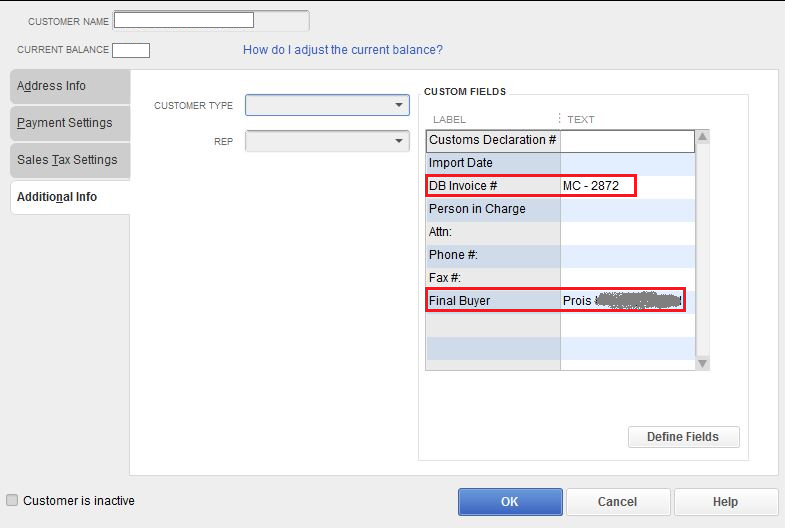 If you edit the custom fields in the Invoice from QuickBooks Application, it will ask to confirm the edit. 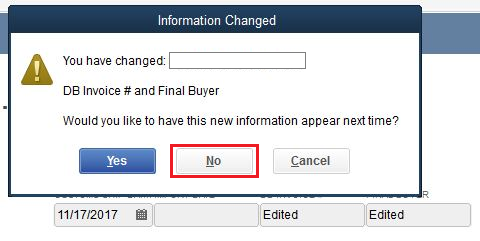 You must answer 'No' to the next question about having this "new information appear next time"
If you answer 'Yes', it will set the defaults in the customer record and prevent any text strings to be written to those fields in the Invoice.